August is here which means field day season is gearing up. Getting in the field to look at research plots can help you start thinking about things you want to implement in your operations for 2017. Field days provide a great opportunity to see the latest trends in soybean production, as well as many other crops. Even if there is not a field day in your area, there are probably some NC Soy research plots. We try very hard to sponsor research across the state so that all of our growers can benefit from the results. The map below shows the counties where the NCSPA is sponsoring research. If there is a project in your area, I would highly encourage you to contact your agent to set up a time to stop by and take a look at the plots. Many of these locations feature new products or practices that you may be interested in trying in 2018. Getting to see them “in action” is valuable for making decisions for next year. Also, the variety demonstrations and OVT trials offer a great opportunity to look at varieties in the field and compare them side by side. 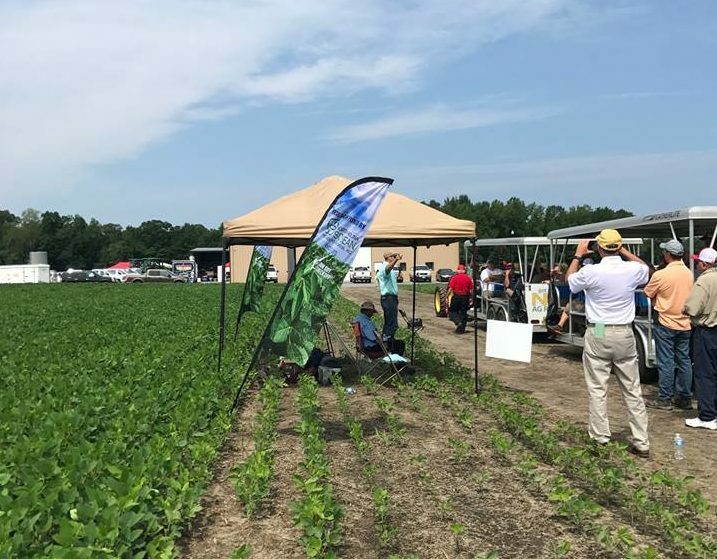 With over 200 soybean varieties being marketed to NC growers, seeing them in person can help you decide what to use in coming years. If you want to learn more about the projects the NCSPA is sponsoring, see our Current Research Projects page. And, as always, if you have ideas or suggestions for future projects, please reach out to our Research Coordinator, Katherine Drake Stowe here.